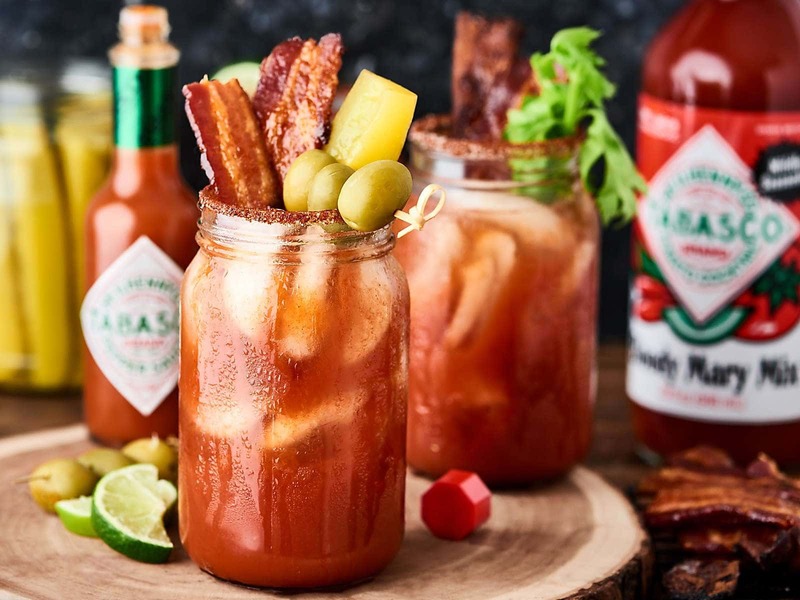 The ultimate Bloody Mary recipe made with Smithworks® Vodka and garnished with Smithfield thick cut cherrywood smoked bacon. Add a few more dashes of TABASCO® Sauce if you like it spicier. Pre-heat oven to 400 degrees F and line a 9x13” baking sheet with a silicone mat (or parchment paper) and place a wire cooling rack on top. Set aside. In a small bowl, mix together TABASCO® Sauce and brown sugar. Set aside. Evenly pour the TABASCO®/brown sugar mixture over the bacon. Bake in pre-heated oven for 20-35 minutes, or until bacon is cooked to your liking, flipping halfway through. Into a large pitcher, pour in TABASCO® Bloody Mary Mix, vodka, pickle juice, lime juice, and TABASCO® Sauce. Place chili powder, salt, and smoked paprika onto a small plate and mix to combine. Run a lime wedge around the rim of the glass then dip the moistened rim into the chili powder mixture and rotate the glass until evenly coated. Fill glass with ice and pour in the spicy bloody mary mixture. Garnish with sweet & spicy bacon and other ingredients - olives, pickles, celery, etc. - to your liking!